How to Edit PDF Files on Mac? 1. How to edit PDF on Mac? I want to modify something on pdf files. What should I do? Is there any software can edit the pdf files on Mac? 2. How do I edit a Downloaded PDF on a Mac? I've just downloaded an application form as a PDF - and need to fill it in online - How is this done on an iMac? 3. Would like to edit, copy, paste, create PDF on my Mac - How and what with? I work with macs (apple computer). I receive quotes and estimates in PDF form. I can open them and print them. I would like to be able to do the following with my PDF files: edit, copy, paste, also create PDF - most important be able to make changes to the PDF files people send me! What software and version do I need to purchase? There are plenty of ways to view and edit PDFs on a Mac, but Apple's built-in Preview application is phenomenal and often overlooked. 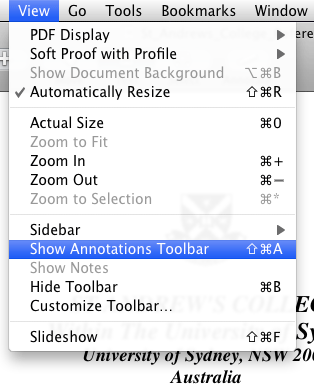 After you select the ‘View: Show Annotations Toolbar’ menu you will see a toolbar across the bottom of the preview window. Those buttons will allow you to edit your PDF files. Preview is fast. Mac OS X isn't exactly known for its speed and efficiency, so Preview's ability to blow through PDF documents is pretty impressive. If you only want to make small changes the built in preview app will do the job. Scribus – FREE – an open source desktop publishing app that has limited PDF editing abilities, and the ability to create your own PDF’s. It brings professional page layout to Linux/UNIX, Mac OS X, OS/2 Warp 4/eComStation and Windows desktops with a combination of press-ready output and new approaches to page design. Underneath a modern and user-friendly interface, Scribus supports professional publishing features, such as color separations, CMYK and Spot Color support, ICC color management, and versatile PDF creation. We all know that PDF files are for viewing not for editing. If you have the original file and want to edit, you can choose to convert the PDF to editable files first. We recommend PDF files be converted to a TXT, HTML, or other file format before editing them. After the file is edited, it can be saved as an updated PDF file. Below are the steps for converting a file using a software program, Free PDF Converter. PDF Converter for Mac is a free but powerful application to convert PDF to other popular formats of files such as editable Text PDF documents or HTML files,Word doc., EPUB eBooks, common JPG/JPEG images, and even SWF files. Download PDF to Edit Converter for Mac, install and run it. 1. Click the button "Add PDF", and add the files you want to convert. 3. Click the button "Convert", and your PDF to Edit conversion will be finished within seconds. Note: Free PDF Converter also enables to customize the output settings for your target files when converting PDF to EPUB, HTML, or JPG images, such as only extracting some part like text or images from the original PDF files. You can click the button "Advanced Setting" to proceed. 1. If you want to edit iTunes M4V videos on mac, M4VGear DRM Media Conveter for Mac gives you the best solution. It converts iTunes M4V videos to other plain video formats such as MP4, MOV, AVI, WMV..., then you can edit the video at ease. 2. If you want to watch your PDF doucments on your iPhone/iPad/iPod Touch, Free iPhone/iPad/iPod manager for Mac will help you in need. Syncios iOS Manager for Mac is a free iTunes alternative, which can easily manage iPhone, iPad and iPod without iTunes and transfer music, videos, photos, apps, ebooks, contacts, messages and more between iOS devices and Mac.